Admit it: It’s not often we see something good and interesting from Mitsubishi anymore. While it’s still huge in some markets, like Asia, here in the U.S. it’s hanging on as best it can with a bunch of new and very much not-so-new crossovers. 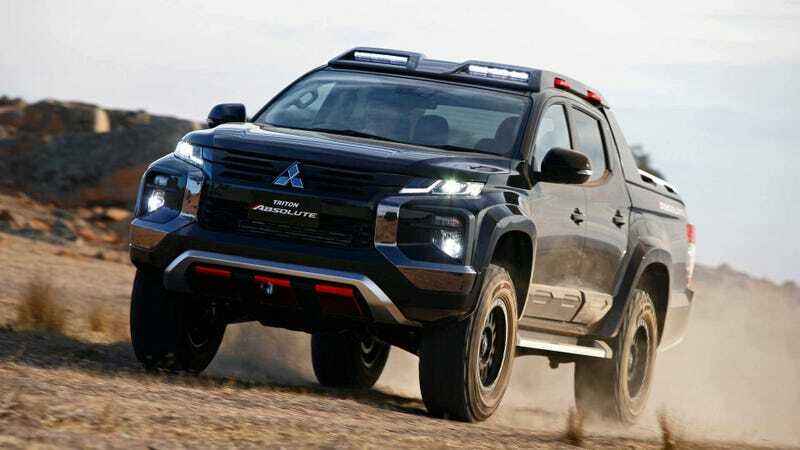 That’s why I’m so into the Mitsubishi Triton Absolute concept. It’s a truck, full of carbon fiber! The Triton is a compact pickup truck sold outside the U.S. as a kind of rival to the Ford Ranger, Toyota Hilux and others. And today at the Bangkok Auto Show in Thailand, where it is built, Mitsubishi unveiled a hotted-up concept version of the truck that I find incredibly desirable. My God, that’s a amazing. Congratulations—after reading that sentence you are now the world’s most feared and powerful lumberjack, capable of felling trees with mighty punches from your bare hands. And you also have a very nice collection of scotch and watches. Anyway, this rides about two inches higher than your average Triton (or L200 as it’s called in some places), has Falken Wildpeak off-road tires, carries LED lights on its roof and features a carbon fiber tailgate and fender flares. This is the good truck! Mitsubishi should sell it here. It’s not like that segment isn’t printing money at the moment.